ISLAMABAD, Pakistan (CNN) -- The top U.S. military commander for the Middle East and Central Asia visited Pakistan on Monday as the Pakistani army battled Taliban militants in the country's northwest, U.S. Embassy officials said. Displaced Pakistanis wait in line Monday after fleeing military operations against militants in South Waziristan. Gen. David Petraeus, the head of U.S. Central Command, held meetings as U.S. Sen. John Kerry, chairman of the Senate Foreign Relations Committee, also arrived on a separate visit. Details about their visits were not immediately available. Petraeus' and Kerry's arrivals came on the heels of Pakistani troops launching a massive ground offensive backed by air power over the weekend in South Waziristan, a refuge and power base for insurgents operating in Pakistan and along the Pakistani-Afghan border. The Pakistani military is trying to "decapitate" the Pakistani Taliban and their allies in the region, an expert said. "There shouldn't be any false perception that the military is going all out after all brands of militants," said Reva Bhalla, director of analysis at the global intelligence company Stratfor. 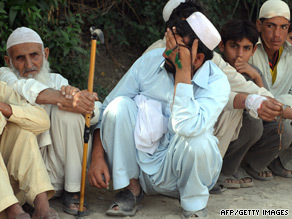 "The focus is the [Pakistani Taliban] and the Uzbeks that are aligned with them." But the insurgent leaders may well have slipped away, Bhalla said, noting that it has been clear for some time this offensive was in the works. "The classic insurgent strategy is to decline combat, melt away and recuperate," she said. Local warlords loyal neither to the Taliban nor the Pakistani government seem to be turning a blind eye to the militants' efforts to evade the army, she said. That may make them impossible to capture or kill. "As the militants are escaping northward, the terrain gets really rough there. It's a challenge to find where they are hiding," Bhalla said. "It's not that easy to pursue them." Both sides have been releasing daily claims about the number of fighters killed on the other side. For example, the Pakistani military said it had killed 18 "terrorists" in South Waziristan. It's not possible to verify either the army's or the Taliban's assertions. But Bhalla said the numbers are not a good measure of success in any case. "In the Swat offensive, every day the Pakistani military was saying we killed X number of militants, and every militant was suddenly a 'high-level militant,' " she said, referring to a Pakistani military operation against the Taliban earlier this year. "That's not the right measure of success -- you want to go after their operational unit and their leadership," Bhalla said. The best way to judge whether an offensive has achieved its aims is to see if the army gains control of territory that has never been under its command, Bhalla said. "Will the military be able to hold the territory that they cleared?" she asked. "There has always been an understanding with the tribal leaders that they have a degree of autonomy. Will the military be able to win over enough of the local population that they can have a base and project power?" The local population is not taking sides until it is clear who will win, she said. "The locals are on the fence because they can't be sure the military will be successful -- so they are going to hedge their bets." The military can help win over a population that has been partly alienated by a Taliban "reign of terror" by "rehabilitating the areas and ensuring that refugees are taken care of -- people who are homeless and struggling to get their daily rations," Bhalla said. The highly anticipated offensive follows a wave of suicide attacks in Pakistan and has prompted the exodus of tens of thousands of civilians, a U.N. refugee agency said. Though the offensive is not the first, it is the most important, Pakistani military spokesman Major Gen. Athar Abbas said, "because we have concluded that this area has become the center of gravity of the problem." One military official said over the weekend that Pakistani troops had seized control of Kotkai, the home village of Pakistani Taliban leader Hakimullah Mehsud and Taliban commander Qari Hussein. Hussein masterminded some of Pakistan's deadliest suicide attacks. Strikes by jet fighters and helicopter gunships targeted militant hideouts in Kotkai and the villages of Badar, Barwand and Khisur -- all strongholds of the Taliban and their late leader, Baitullah Mehsud, another official said. For months, the military have targeted militant hideouts in South Waziristan and other hot spots in Pakistan's tribal areas. Earlier this year, troops launched a large operation targeting militants in the Swat Valley in Pakistan's North-West Frontier province. Despite such efforts, insurgents have continued to strike with relative impunity in Pakistan, targeting government, police and security locations. The recent wave of deadly attacks has raised concerns about the ability of Pakistan's security forces to maintain control. The violence also has heightened internal and international pressure on the government to take swift and effective action. Pakistani officials said about 10,000 to 15,000 militants linked to the Taliban or to al Qaeda operate in South Waziristan, a harsh terrain familiar to militants but difficult for others to navigate. About 28,000 Pakistani soldiers have moved into the epicenter of Taliban activity in the region to counter their activities, officials said. CNN's Reza Sayah and Richard Allen Greene and journalist Nasir Dawar contributed to this report.